Leaving the haven that is your university halls is a tough decision to make. However, various rewards are in store for you when you brave the outside world and find the best of student houses located in Winona. WsYOU/Bluff City Properties offers safe, comfortable apartments and student houses located in Winona. Our team continuously expands our offerings to accommodate more renters. We also help steer students toward long-term success and a bright future through paid internships, academic scholarships, and athletic sponsorships foe students at WSU. Obtaining any of the available student houses in Winona known for stellar safety should be your top priority when you plan to live off campus. If you let this aspect of student houses in Winona be compromised, your health and life will be at stake. Our staff understands this greatly, which is why we’ve always been strict with the security and safety of our student houses in Winona. Our student houses in Winona, as well as their bedrooms and garages, are separately keyed. Meanwhile, many of our buildings are equipped with remote-access key-card technology, making entry extra secure. Unless you’re a resident or an expected guest, you’ll have no means of entering our student houses in Winona. Security cameras are also placed in different locations throughout the residence, such as walkways outside student houses in Winona and common rooms inside buildings. To this day, we continue the installation of surveillance equipment for the maximum security of our student houses in Winona. Besides the hi-tech locking systems of our student houses in Winona, we offer a secure place for the safekeeping of our renters’ belongings, including bikes and scooters. Our student houses in Winona also come with secure parking spaces. As a resident of one of our student houses in Winona, you’ll be given your own lock to ensure the security of the storage and parking space rented to you. When you decide to live off campus and move out of your dorm, university buildings will be farther from reach. The ideal choice among student houses in Winona is the one that’s closest to your campus. This can help you cut commuting costs and shorten your trip to the university. The majority of our properties, such as our student houses in Winona, are only a short ride or walk away from Winona State University. Others can be reached on foot, by bus, or by bicycle. 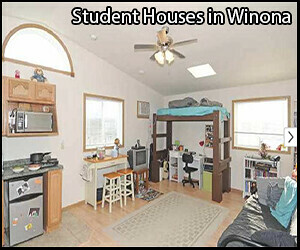 Many of our student houses in Winona are even closer to classrooms than on-campus dorms. As a bonus, students have easy access to commercial establishments near our student houses in Winona, such as restaurants, banks, a grocery store, and an urgent care center. When you compare student houses in Winona, you’ll want to check on their management and maintenance. No matter how sturdy some student houses in Winona look, there’s no guarantee that those who occupy these units will be safe from accidents. Additionally, renters won’t be able to enjoy the basic amenities of student houses in Winona if management and maintenance services are inefficient. At WsYOU/Bluff City Properties, the health and safety of our renters are our top priorities. Our maintenance team is on call 24/7 to offer immediate assistance should an unpleasant event strike without warning. We also constantly improve our student houses in Winona for the maximum satisfaction of our tenants. Moving out of your dorm isn’t so bad. Life off campus is brimming with exciting possibilities. Rent one of our student houses in Winona, and we’ll help you live safely outside your university. To schedule a tour of our affordable student houses in Winona, contact us.